38 To pickle Peaches. 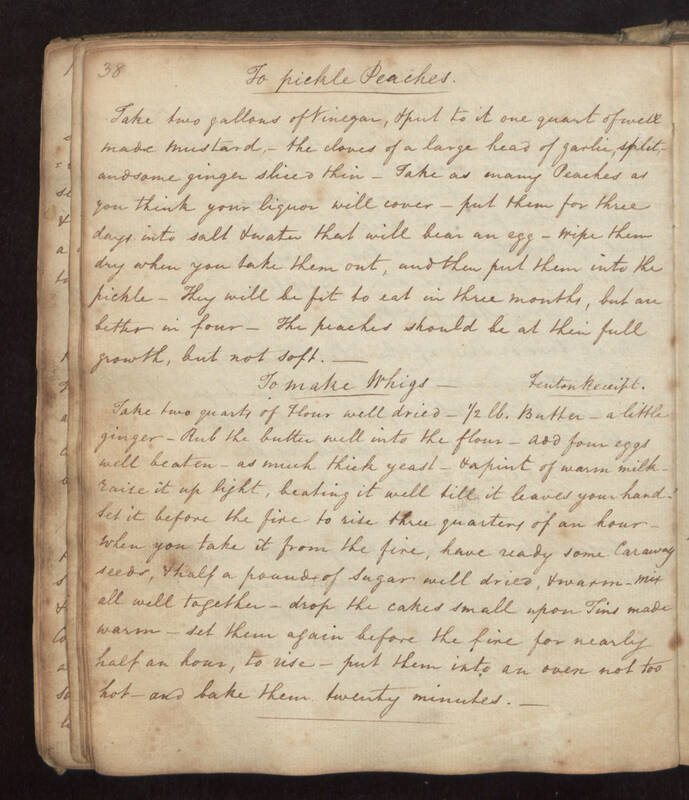 Take two gallons of Vinegar, & put to it one quart of well made mustard, - the cloves of a large head of garlic, split, - and some ginger sliced thin - Take as many Peaches as you think your liquor will cover - put them for three days into salt & water that will bear an egg - Wipe them dry when you take them out, and then put them into the pickle - They will be fit to eat in three months, but are better in four - The peaches should be at their full growth, but not soft. To Make Whigs. Fenton Receipt. Take two quarts of Flour well dried - 1/2 lb. Butter - a little ginger - Rub the butter well into the flour - add four eggs well beaten - as much thick yeast - & a pint of warm milk - raise it up light, beating it well till it leaves your hand. Set it before the fire to rise three quarters of an hour - When you take it from the fire, have ready some Caraway seeds, & half a pound of Sugar well dried, & warm - Mix all well together - drop the cakes small upon Tins made warm - Set them again before the fire for nearly half an hour, to rise - put them into an oven not too hot and bake them twenty minutes.